Couldn't make it to YALLWest? Here’s a chance to win some of the best items from our booth at the show — but from home! Enter below for a chance to win a collection of our hottest books and super cool swag from authors like V.E. Schwab, Jennifer L. Armentrout, Courtney Summers, & more. ELIGIBILITY: The Fierce Reads' YALLWEST Win from Home Sweepstakes (the "Sweepstakes") The Fierce Reads' YALLWEST Win from Home Sweepstakes (the "Sweepstakes") is open only to persons who as of the date of entry (and, if a winner, as of the date of prize fulfillment) are a legal resident of the 50 United States or the District of Columbia and who are 13 years of age or older. We are sorry for the geographic restrictions, unfortunately it is required for various legal reasons. Persons who as of the date of entry (and, if a winner, as of the date of prize fulfillment) are an employee of Macmillan Publishers ("Sponsor") or any of Sponsor's Affiliates (as defined in Section 5), and members of the immediate family or household (whether or not related) of any such employee, are not eligible. Eligibility determinations will be made by Sponsor in its discretion and will be final and binding. U.S. law governs this Sweepstakes. Void where prohibited by law. ("Sponsor") or any of Sponsor's Affiliates (as defined in Section 5), and members of the immediate family or household (whether or not related) of any such employee, are not eligible. Eligibility determinations will be made by Sponsor in its discretion and will be final and binding. U.S. law governs this Sweepstakes. Void where prohibited by law. HOW TO ENTER: The entry period for the Sweepstakes begins at 12:00 a.m. Eastern Time (ET) on Friday, May 4, 2018 and continues through 11:59 p.m. ET on Sunday, May 20, 2018 (the "Entry Period"). No purchase is necessary. Any entrant who is under 18 years of age or otherwise under the legal age of majority in the jurisdiction in which the entrant resides (a "Minor") must obtain permission to enter from his or her parent or legal guardian, and the agreement of the parent or legal guardian to these Official Rules, prior to entry. To enter the Sweepstakes, during the Entry Period, entrants must access, complete and submit the Sweepstakes entry form (which will require entrant to submit his or her e-mail address and such other information as Sponsor may require), found in entrant's Facebook or Instagram newsfeed or alternatively by visiting Sponsor's website located at bit.ly/fiercereadsyallwest (the "Website") and following the on screen entry instructions. The Facebook and Instagram entry forms may be pre-filled with information provided by the Facebook or Instagram platform.There is a limit of one entry per person and per email address. All entries must be completed and received by Sponsor prior to the conclusion of the Entry Period. Entry times will be determined using Sponsor's computer, which will be the official clock for the Sweepstakes. Normal time rates, if any, charged by the entrant's Internet or mobile service provider will apply. All entries are subject to verification at any time. Proof of submission does not constitute proof of entry. Sponsor will have the right, in its discretion, to require proof of identity and/or eligibility in a form acceptable to Sponsor (including, without limitation, government-issued photo identification). Failure to provide such proof to the satisfaction of Sponsor in a timely manner may result in disqualification. WINNER SELECTION AND NOTIFICATION: Following the conclusion of the Entry Period, two potential Grand Prize winner(s) will be selected in a random drawing conducted by Sponsor or its agent from among all eligible entries received during the Entry Period. The odds of winning will depend on the number of eligible entries received. The potential winner will be notified by e-mail (sent to the e-mail address provided by the entrant when entering), or using other contact information provided by the potential winner, in Sponsor's discretion. If the initial notification requires a response, the potential winner must respond to Sponsor's initial notification attempt within 72 hours. The potential winner is subject to verification of eligibility and may, in Sponsor's discretion, be required to complete, sign and return to Sponsor an Affidavit of Eligibility/Release of Liability or an Affirmation of Eligibility/Release of Liability, as determined by Sponsor, and, if legally permissible, a Publicity Release, and any other documentation provided by Sponsor in connection with verification of the potential winner's eligibility and confirmation of the releases and grant of rights set forth herein (as applicable, "Winner Verification Documents"), within seven days of attempted delivery of same. The potential winner may also in Sponsor's discretion be required to complete and return to Sponsor an IRS Form W-9 within seven days of attempted delivery of same. If the potential winner is a Minor, Sponsor will have the right to request that the potential winner's parent or legal guardian sign the Winner Verification Documents on behalf of the winner, or to award the prize directly in the name of the winner's parent or legal guardian, who in such event will be required to sign the Winner Verification Documents and/or an IRS Form W-9. If the potential winner cannot be reached or does not respond within 72 hours of the initial notification attempt or fails to complete, sign, and return any required Winner Verification Documents or IRS Form W-9 within seven days of attempted delivery of same, or if the potential winner does not otherwise comply with these Official Rules and/or cannot accept the prize as awarded for any reason, then the potential winner may be disqualified and an alternate winner may, at Sponsor's discretion, be selected from among the remaining eligible entries as specified in these Official Rules (in which case the foregoing provisions will apply to such newly-selected entrant). PRIZE: Two Grand Prize(s) will be offered. The Grand Prize consists of a set of four, postcard sized art prints inspired by the Shade of Magic series by V.E. Schwab, an ARC of THE DARKEST STAR by Jennifer L. Armentrout, an ARC of SADIE by Courtney Summers, a Wednesday Books tote bag, an ARC of STAR-TOUCHED STORIES by Roshani Chokshi, an ARC of THE RAGING ONES by Krista and Becca Ritchie, an ARC of DANCE OF THIEVES by Mary E. Pearson, an ARC of THE OUTCAST by Taran Matharu, a Children of Blood and Bone (by Tomi Adeyemi) poster, an ARC of MIRAGE by Somaiya Daud, and a collector's set of 4 buttons inspired by Legendary by Stephanie Garber. The approximate retail value ("ARV") of the Grand Prize is $143.93 USD. The aggregate ARV of all prizes is $287.86 USD. The exact value will depend on where the winner resides and market conditions at the time of prize fulfillment. All prize details that are not expressly specified in these Official Rules will be determined by Sponsor in its discretion. The prize will be awarded if properly claimed. No substitution, cash redemption or transfer of the right to receive the prize is permitted, except in the discretion of Sponsor, which has the right to substitute the prize or any component of the prize with a prize or prize component of equal or greater value selected by Sponsor in its discretion. The prize consists only of the item(s) expressly specified in these Official Rules. All expenses or costs associated with the acceptance or use of the prize or any component of the prize are the responsibility of the winner. If a prize component consists of digital content, entrant may need a compatible reading application to read the content. The prize is awarded "as is" and without any warranty, except as required by law. In no event will more than the number of prizes stated in these Official Rules be awarded. All federal, state and local taxes on the value of the prize are the responsibility of the winner. An IRS form 1099 will be issued if required by law. RELEASE AND LIMITATION OF LIABILITY: By entering the Sweepstakes, to the fullest extent permitted by applicable law, each entrant on behalf of himself or herself and anyone who succeeds to entrant's rights and responsibilities including without limitation entrant's heirs, executors, administrators, personal representatives, successors, assigns, agents, and attorneys, and with respect to minors entrant's parents and legal guardians (collectively the "Entrant Parties") releases Sponsor, each of Sponsor's Affiliates, the licensees and licensors other than Entrant Parties including authors of each of the foregoing, all other companies involved in the development or operation of the Sweepstakes, Facebook, Instagram, the successors and assigns of each of the foregoing and the directors, officers, employees and agents of each of the foregoing (collectively, the "Released Parties") from and against any and all claims and causes of action of any kind that entrant and/or the Entrant Parties ever had, now have or might in the future have arising out of or relating to the Sweepstakes, participation in the Sweepstakes, the use of the Website, the provision, acceptance or use of any prize or any component thereof or any use of the entrant's name as permitted pursuant to these Official Rules, including without limitation any and all claims and causes of action: (a) relating to any personal injury, death or property damage or loss sustained by any entrant or any other person, (b) based upon any allegation of violation of the right of privacy or publicity, misappropriation, defamation, or violation of any other personal or proprietary right, (c) based upon any allegation of infringement of copyright, trademark, trade dress, patent, trade secrets, moral rights or any intellectual property right, or (d) or based upon any allegation of a violation of the laws, rules or regulations relating to personal information and data security. Each entrant on behalf of himself or herself and the Entrant Parties agrees not to assert any such claim or cause of action against any of the Released Parties. Each entrant on behalf of himself or herself and the Entrant Parties assumes the risk of, and all liability for, any injury, loss or damage caused, or claimed to be caused, by participation in this Sweepstakes, the use of the Website, or the provision, acceptance or use of any prize or any component of any prize. The Released Parties are not responsible for, and will not have any liability in connection with, any typographical or other error in the printing of the offer, administration of the Sweepstakes or in the announcement of the prize. The Released Parties are not responsible for, and will not have any liability in connection with, late, lost, delayed, illegible, damaged, corrupted or incomplete entries, incorrect or inaccurate capture of, damage to, or loss of entries or entry information, or any other human, mechanical or technical error of any kind relating to the operation of the Website, communications or attempted communications with any entrant or Entrant Parties, the submission, collection, storage and/or processing of entries or the administration of the Sweepstakes. The term "Affiliate" of Sponsor means any entity that directly or indirectly, through one or more intermediaries, controls, is controlled by, or is under common control with Sponsor. The term "control" means the possession, directly or indirectly, of the power to direct or cause the direction of management and policies of an entity, or the ownership, directly or indirectly, of more than fifty percent (50%) of the equity interests of the entity. GENERAL RULES: Sponsor has the right, in its sole discretion, to modify these Official Rules (including without limitation by adjusting any of the dates and/or timeframes stipulated in these Official Rules) and to cancel, modify or suspend this Sweepstakes at any time in its discretion, including without limitation if a virus, bug, technical problem, entrant fraud or misconduct, or other cause beyond the control of the Sponsor corrupts the administration, integrity, security or proper operation of the Sweepstakes or if for any other reason Sponsor is not able to conduct the Sweepstakes as planned (including without limitation in the event the Sweepstakes is interfered with by any fire, flood, epidemic, earthquake, explosion, labor dispute or strike, act of God or of public enemy, communications failure, riot or civil disturbance, war (declared or undeclared), terrorist threat or activity, federal, state or local law, order or regulation or court order) or in the event of any change to the terms governing the use of Facebook or Instagram or the application or interpretation of such terms. In the event of termination of the Sweepstakes, a notice will be posted on the Website or Sponsor's Facebook and Instagram page and a random drawing will be conducted to award the prize from among all eligible entries received prior to the time of termination. Sponsor has the right, in its sole discretion, to disqualify or prohibit from participating in the Sweepstakes any individual who, in Sponsor's discretion, Sponsor determines or believes (i) has tampered with the entry process or has undermined the legitimate operation of the Website or the Sweepstakes by cheating, hacking, deception or other unfair practices, (ii) has engaged in conduct that annoys, abuses, threatens or harasses any other entrant or any representative of Sponsor or (iii) has attempted or intends to attempt any of the foregoing. CAUTION: ANY ATTEMPT TO DELIBERATELY DAMAGE ANY WEBSITE OR SOCIAL MEDIA PLATFORM ASSOCIATED WITH THIS SWEEPSTAKES OR UNDERMINE THE LEGITIMATE OPERATION OF THIS SWEEPSTAKES IS A VIOLATION OF CRIMINAL AND CIVIL LAW. SHOULD SUCH AN ATTEMPT BE MADE, SPONSOR HAS THE RIGHT TO SEEK DAMAGES (INCLUDING ATTORNEYS' FEES) FROM ANY PERSON INVOLVED TO THE FULLEST EXTENT PERMITTED BY LAW. The use of agents or automated devices, programs or methods to submit entries is prohibited and Sponsor has the right, in its sole discretion, to disqualify any entry that it believes may have been submitted using such an agent or automated device, program or method. In the event of a dispute regarding who submitted an entry, the entry will be deemed to have been submitted by the authorized account holder of the email address submitted at the time of entry. "Authorized account holder" means the person who is assigned an email address by an internet provider, online service provider or other organization (e.g., business, educational institute, etc.) that is responsible for assigning email addresses for the domain associated with the submitted email address. An entrant may be required to provide proof (in a form acceptable to Sponsor, including, without limitation, government-issued photo identification) that he or she is the authorized account holder of the email address associated with the entry in question. All federal, state, and local laws and regulations apply. All entries become the property of Sponsor and will not be verified or returned. By participating in this Sweepstakes, entrants on behalf of themselves, and to the extent permitted by law on behalf of the Entrant Parties agree to be bound by these Official Rules and the decisions of Sponsor, which are final and binding in all respects. These Official Rules may not be reprinted or republished in any way without the prior written consent of Sponsor. DISPUTES: By entering the Sweepstakes, each entrant on behalf of himself or herself and the Entrant Parties agrees that, to the maximum extent permitted by applicable law, (a) any and all disputes, claims and causes of action arising out of or connected with the Sweepstakes, or the provision, acceptance and/or use of any prize or prize component, will be resolved individually, without resort to any form of class action (Note: Some jurisdictions do not allow restricting access to class actions. This provision will not apply to entrant if entrant lives in such a jurisdiction); (b) any and all claims, judgments and awards shall be limited to actual out-of-pocket costs incurred, including costs associated with entering the Sweepstakes, but in no event attorneys' fees; and (c) under no circumstances will any entrant or Entrant Party be permitted to obtain any award for, and each entrant and Entrant Party hereby waives all rights to claim, punitive, special, incidental or consequential damages and any and all rights to have damages multiplied or otherwise increased and any other damages, other than for actual out-of-pocket expenses. All issues and questions concerning the construction, validity, interpretation and enforceability of these Official Rules or the rights and obligations of the entrants, Entrant Parties and Sponsor in connection with the Sweepstakes shall be governed by, and construed in accordance with, the laws of the State of New York in the United States of America without giving effect to any choice of law or conflict of law rules or provisions that would cause the application of the laws of any jurisdiction other than the State of New York. Any legal proceedings arising out of this Sweepstakes or relating to these Official Rules shall be instituted only in the federal or state courts located in New York County in the State of New York, waiving any right to trial by jury, and each entrant and Entrant Party consents to jurisdiction therein with respect to any legal proceedings or disputes of whatever nature arising under or relating to these rules or the Sweepstakes. In the event of any conflict between these Official Rules and any Sweepstakes information provided elsewhere (including but not limited in advertising or marketing materials), these Official Rules shall prevail. USE OF INFORMATION: Personal information supplied is subject to applicable data protection laws and Sponsor's Privacy Notice at https://us.macmillan.com/privacy-notice. By entering the sweepstakes, entrants acknowledge that they have read Sponsor's Privacy Notice and hereby agree to Sponsor's collection and use of their personal information in accordance with such laws and Privacy Notice. WINNER NAME AND RULES REQUESTS: For the name(s) of the winner(s), which will be available two weeks after the conclusion of the Entry Period, or a copy of these Official Rules, send a self-addressed, stamped envelope to Fierce Reads' YALLWEST Win from Home Sweepstakes, Internal Communications, 175 Fifth Avenue, New York, NY 10010. Winner name requests must be received by Sponsor within six months after the conclusion of the Entry Period. SPONSOR: Macmillan Publishers, 175 Fifth Avenue, New York, NY 10010. The Sweepstakes is in no way sponsored, endorsed or administered by, or associated with, Facebook or Instagram. 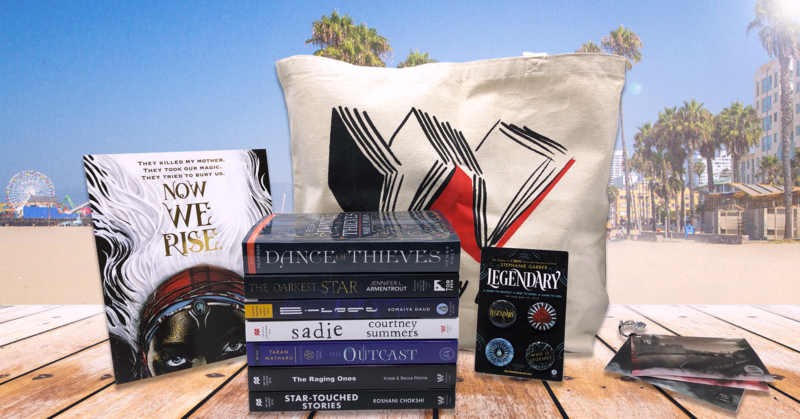 By entering this Sweepstakes, I am also subscribing to the Fierce Reads newsletter, Tor Teen newsletter, Wednesday Books newsletter and Young Adult newsletter and agree to the above rules. See the Macmillan Privacy Notice. By entering below, I agree to the above rules and will be entered into the Sweepstakes. Also, please sign me up for the following selected newsletter email(s) with updates and other information about Macmillan Publishers' books, products and services that may be of interest to me. Consent can be withdrawn at any time. The newsletters and/or publishers listed below are all divisions of Macmillan Publishers. See Macmillan Privacy Notice. Contact Us.